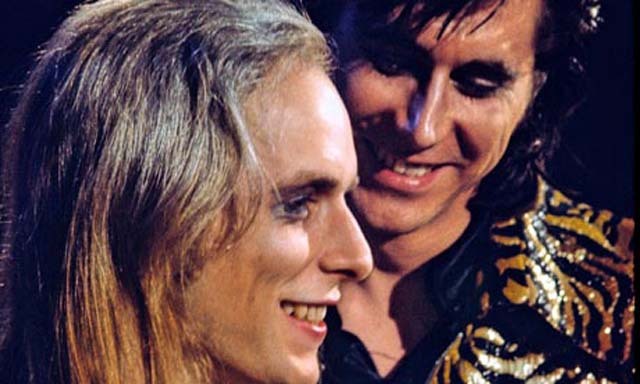 Eno glams it up with Bryan Ferry in the new documentary about his early career. Clocking in at 2½ hours, Brian Eno, 1971-1977 : The Man Who Fell To Earth is as informative and comprehensive as any unauthorized documentary has a right to be. An in-depth look at a significant six-year period in the life and career of the music/composer/producer, the movie offers more or less what we’ve come to expect from a rock documentary — just a lot more of it than we usually see. So viewers interested in the formative professional years of the glam-flavored synth-rocker, who moved into ambient music as the decade progressed, will be presented with lots of Eno performance clips (the ones with his first significant band, Roxy Music, are the most prominent), lots of interviews with rock historians and critics (most notably music journalist Robert Christgau) and lots of chats with his collaborators (including guitarists Chris Spedding and David O’List). No, there aren’t any newly recorded one-on-ones with the Eno himself, but a handful of archival clips have been incorporated into the film. One aspect of Eno’s career within the period covered that doesn’t receive all that much attention is the influential producing he did for early albums by such seminal bands as Talking Heads and Devo. But there is ample coverage of other work he did with Robert Fripp, David Bowie, Ultravox and other artists of the era. Of course, Eno’s own music and albums (beginning with his 1974 solo debut Here Come the Warm Jets) are given the lion’s share of talk and analysis. The only significant bonus feature on the DVD is an extended interview with guitarist Lloyd Watson, who mainly talks about his work with Eno when they were part of the short-lived group 801.